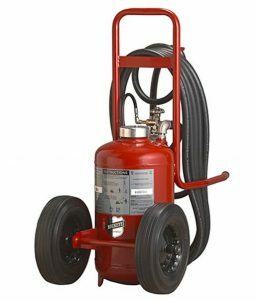 Wheeled fire extinguishers are an essential component of fire protection programs for industrial and commercial operations. 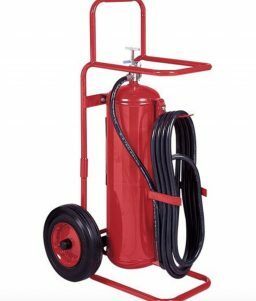 Commonly used in ship docks, ships, refineries, construction sites, chemical plants, storage facilities, laboratories, and any other facilities where the need to transport a heavy-duty fire extinguisher is required. Purple K Dry Chemical fire extinguishers are most effective in extinguishing Class B flammable liquid and is also effective in fighting Class C fires associated with energized electrical equipment. This powder extinguishes the fire by interfering with the chemical chain reaction taking place in the combustion zone. The smaller 50 lb. 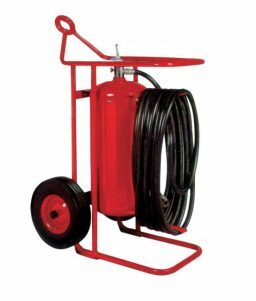 wheeled fire extinguisher model comes with either a 25-foot hose and all larger wheeled fire extinguisher models provide a 50-foot hose for even further reach. Their durable construction, broad base of support, and functional design allow for ease of transport and maneuverability, ensuring that it can be operated by a single person and moved through doorways, down narrow corridors and around obstacles.